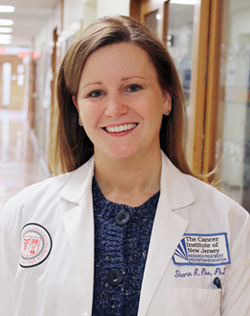 New Brunswick, N.J. – Sharon Pine, PhD, a researcher at The Cancer Institute of New Jersey and assistant professor of medicine at the University of Medicine of Dentistry of New Jersey-Robert Wood Johnson Medical School has been awarded a two-year, $80,000 dollar research grant from the Prevent Cancer Foundation. The funding will support study on the early detection and prevention of lung cancer. The Cancer Institute of New Jersey is a Center of Excellence of UMDNJ-Robert Wood Johnson Medical School. Smoking is the most common risk factor for developing lung cancer. According to the U.S. Department of Health and Human Services, the risk of developing lung cancer is about 23 times higher in male smokers and 13 times higher in female smokers, as compared to lifelong nonsmokers. Research has shown that certain genetic factors may predispose some individuals to be more susceptible to developing cancer than others, particularly after being exposed to tobacco smoke or environmental pollutants. Dr. Pine and colleagues will explore changes in DNA – one’s genetic code – within the energy generating portion of the cell, known as the mitochondria. The mitochondrial genome is highly susceptible to DNA damage in the form of content changes and mutations, and once damaged, has limited ability for DNA repair. Recent studies suggest that mitochondrial DNA content and mutations increase in some people who are exposed to tobacco smoke, thus serving as possible markers to identify those with higher sensitivity to cancer-causing compounds in tobacco smoke. Pine’s team will determine if certain changes in mitochondrial DNA can help identify especially sensitive individuals in three categories – current smokers, who have the highest risk of lung cancer overall, former smokers and those who have never smoked. Pine, a Neshanic Station (Somerset County) resident, is hopeful the project will help transform lung cancer screening regimes. "We envision a time when current smokers are informed of their individual risk for lung cancer so that they gain a more personalized perspective and deeper motivation to quit smoking. We also envision a time when current and former smokers at high risk are monitored more closely for their development of the disease, and when non-smokers exposed to second-hand smoke who are also deemed at high risk can be armed with the knowledge needed to change their environment and undergo monitoring for the disease," she said. Funding for the project, "MtDNA biomarkers for early detection and prevention of lung cancer" -- which received a high priority score from the Foundation’s Scientific Review Panel, runs through February 15, 2015.